I drink a lot of things, but I am not a great beer drinker. So many other people seem to like it (peer pressure!) that I really do try. Granted, I have my own beer coach, Takeout associate editor and beer judge Kate Bernot, available to help me find the perfect wheat beer or IPA I might actually like. 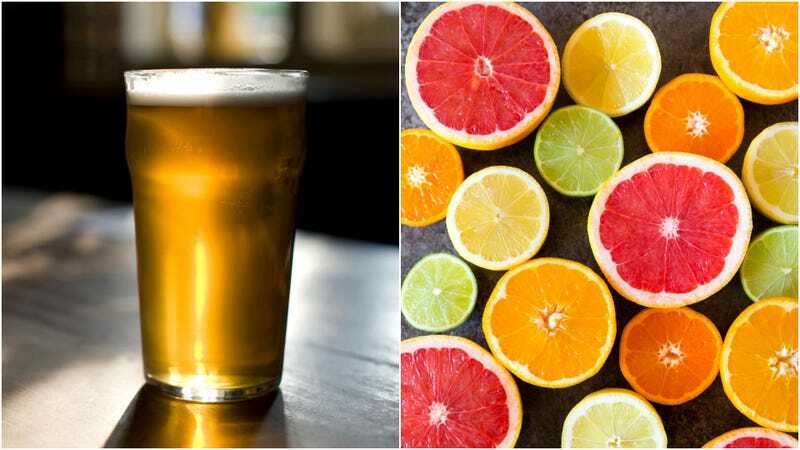 So many times when I’m at a tavern where the wine comes in two varieties—white or red—I will instead opt for a radler. Usually it’s Steigl Grapefruit, or the Leininkugel Summer Shandy (Kate tells me those two terms, radler and shandy, are pretty interchangeable). They’re delicious (I don’t doubt that it has tons of sugar), voluminous (I believe a Stiegl can holds upwards of 16 ounces), and lighter in alcohol than regular beer or wine, which certainly helps on a night I’m hanging out. The only trouble is that after can or two I am so bloated I look like I’m going to come down your chimney at Christmas. But all that juice makes it difficult to get way too inebriated on a radler (except for the time I waitress talked me into throwing a shot of gin in there. Never again.) In summer, I find it a very flavorful and refreshing drinking option. So Kate then sent me three radler options. She encouraged tinkering with her suggested ratios to taste: “The main thing is to just keep testing out ratios until the drink feels refreshing but not watered-down.” All were delicious, but in their own distinct ways. Kate advised, “I’d try to get the freshest-possible lemonade, either the fresh-squeezed kind from the grocery store or a good bottled version.” I went to Whole Foods and got the their top-of-the-line housemade lemonade. “For the wheat beer,” she said, “you just want a standard, no-other-stuff-in-it wheat beer like Bell’s Oberon or Sam Adams Summer Ale.” Lacking these options, I went with Goose Island 312 Wheat Ale, which Kate said was a perfect choice. Score! Although Kate suggested starting with a 50/50 ratio for this one, I realized that one thing that always bugged me about the Stiegl was how sweet it was, so I probably went about 70/30 beer to juice (Kate did say she approves of tinkering) to lighten that effect. Still, this pale version was far and away the lightest and most refreshing of the three, like a lemonade with an added intriguing bonus. This is an all-day drink for sure. Suggested setting: Backyard barbecue, beach, any time you will be outside drinking for a long time and need something that can go the long distance of partying. This is actually the official Steigl radler combo. Kate advised, “Look for any beer with ‘German pils or German pilsner’ on it. If you can’t find one, anything that says pilsner should work in a pinch.” That is true: We found a can of Miller Lite in the office and even that tasted amazing combined in equal portions of grapefruit juice. So the pulp made this drink a little thicker than number 2, better for more refined, concentrated drinking than all-day sipping. Still, the pilsner and grapefruit made for an unbelievable combo, both bringing out the best in the other. The tartness of the grapefruit juice meant that the drink wound up super-dry yet still refreshing, with a taste that was appealingly sour but never swayed into bitter. I think Kate may be a beer genius, you guys. Suggested setting: Fancy outdoor concert picnic, backyard dinner party, movie in the park, when you want to drink beer but tell yourself it’s something a little fancier. As usual, she was right: I used a thick mango juice that added an unusual sweetness to the fruity hop flavor. It was a drink with a lot of strength, kind of like a beer smoothie, but the juice definitely made it a hops beverage I was much more likely to finish a whole pint of. Somehow the richness of the mango tempered the bitterness of the hops. This is one for consummate sipping. Suggested setting: Outdoor fire pit, curled up with a book on the beach, dinner date with a fellow hops lover. All told, I think you could throw a great summer party by having the three delicious options above as your signature drinks. Your guests are bound to be impressed: Nobody has to know that they only have two ingredients (and you can throw some citrus garnish on there just to fancy it up). I still may never be the world’s greatest beer drinker, much as I try. But apparently, just throw a little juice in there, and I’m completely on board.